The Dual Stream Swimfit swim spa is the ultimate hybrid of fitness and fun when you want everything! The dual-temp feature keeps you at peak performance temperature during the most vigorous low-impact workout, while the other side heats up for a soothing, post-exercise soak. Swim stationary laps for a full-body workout, row to work the upper body and arms, or jog underwater for a cardiovascular workout. 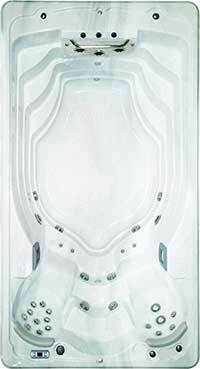 Afterward, enjoy a massage with fully-adjustable, hydrotherapy jets. Make the most of your backyard in the largest, most dynamic swim spa available! We provide top quality hot tubs, spas & billiards (pool table and accessories) sales, installation, and service serving Reno, Sparks, Spanish Springs, Carson City, and Incline Village, NV.